The Cypress Weekend School students and teachers participated in a all-volunteer program at the Houston Food Bank. Fourteen young students aged between seven and fifteen years accompanied by eleven adults – teachers, school administration and parents – left the Cypress Islamic Center on Saturday, February 7 with the food that had been donated by the Cypress community. They arrived a the HFB around 10 am and were able to work with hundreds of other volunteers from all over Houston sorting out edible and other items. Each member of the Cypress team was also wearing a special T Shirt which visibly displayed the logos of the Cypress Islamic Center and the Weekend school. Br. Javed assisted with ordering the T shirts. 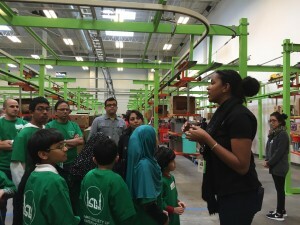 Wearing the distinctive T shirts helped inform others in the community that the Muslim students were engaged in the social activities in the Houston community. It was a form of dawah. The students were excited about the project and took great pride in helping the less fortunate in the community. At the completion, the manager announced that by their work, the morning group of volunteers (including those from the Cypress Weekend School) had indirectly helped feed an estimated 9,000 residents of Houston. She reminded everyone that those are are “food insecure” can very well be our next door neighbors. We may have a job and food on the table today, but who knows about tomorrow. Only by helping others we ensure a safety net for all. The students had their thank you lunch at the Jameelah Halal Chinese restaurant. Thanks to Br. Sohail for his support of this school project. The vision of the Weekend School team is to build leadership qualities in our students. Other projects are being designed to engage the students in social service activities.